Chrissy Teigen Sunday night dinners have become a staple for my girlfriends and me. Not only are the recipes in Chrissy Teigen’s “Cravings” cookbook easy to follow, but so far all of them are amazingly delicious. So far I have hosted two Sunday night dinners featuring recipes from the “Cravings” cookbook. The first dinner, we went a little overboard, we made three different recipes – the crispy prosciutto salad, street corn and fish tacos (ALL amazing by the way! ), so when it came time to plan the menu for our second dinner, we opted to try just one recipe and make it the star. We decided on Pepper’s Spicy Clams and Pasta and set off to the best seafood counter in town, Santa Monica Seafood to get the best clams this side of the 405. Armed with clams, pasta, and Justin wine we returned to my place and let the cooking party begin. 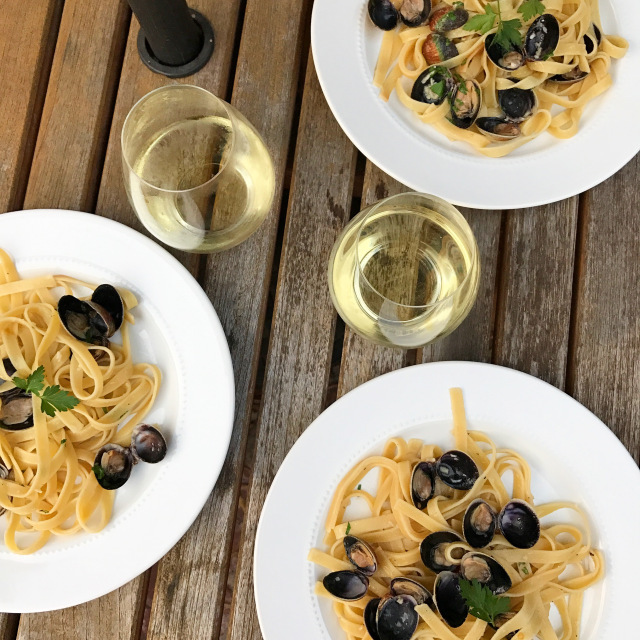 Pepper’s Spicy Clams and Pasta is a quick and easy recipe once you de-sand all the clams. 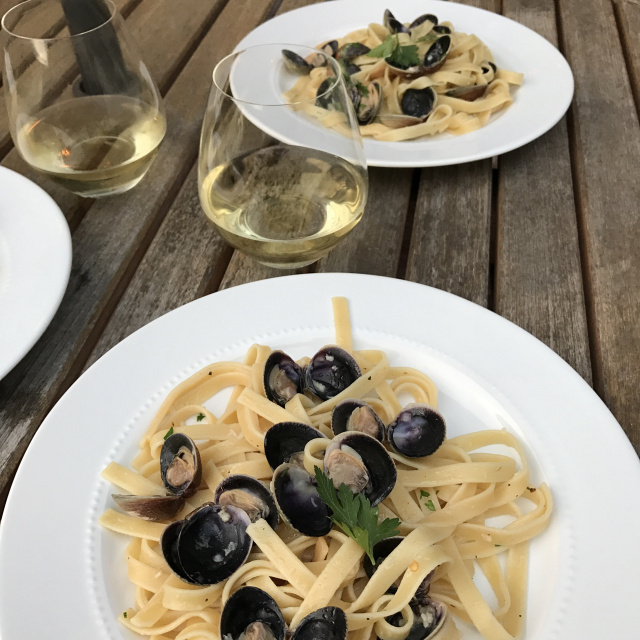 My advice is to drop your clams in a large bowl of water for 30 minutes, pop open a bottle of wine (don’t drink it all – you still need some for the recipe!) and enjoy 20-30 minutes of girl talk until your clams are de-sanded, then it’s time to get to work! Meanwhile, in a large skillet, heat the butter and olive oil over medium heat. When the butter foams, add the garlic and red pepper flakes and cook until the garlic is fragrant and very lightly golden, 2 to 3 minutes. Add the wine and pepper, increase the heat slightly, and cook until bubbling, about 2 minutes. Add the clams, increase the heat, cover, and cook just until the clams open, about 3 minutes. Transfer the opened clams to the pasta pot. (If some clams are stubborn, re-cover the pan for another minute or two; if the clams still don’t open, ditch them.) Taste the sauce and add salt to taste. Add any remaining cooked clams and all the clam liquid to the drained pasta. Warm through over medium heat, adding the reserved pasta water as needed to help bind the sauce. Toss in the parsley, divide the pasta and clams among bowls, and garnish with more parsley if you want. Recipe from "Cravings" by Chrissy Teigen also found here.